I’m often asked about the best practices for taking meeting notes, including how to process them after the meeting. Here are some tips and suggestions that I hope will be useful to you. Capturing ideas, relevant information, etc. during meetings is important so that you don’t have to rely on your brain to remind you about them later. How best to capture that information is purely a personal preference – some people like to use electronic note-taking devices, some people prefer pen and paper. 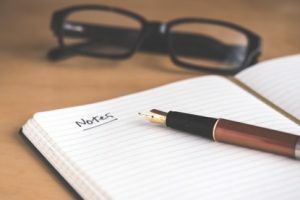 Regardless of which tool you use, keep in mind that taking notes during meetings is just “collecting”, and the notes will need to be processed just like any other input – email, paper, etc. It would be one thing if we returned to our desk from a meeting and could say with 100% certainty that EVERYTHING we wrote down during the meeting was reference info that could be filed immediately. But what happens of course, more often than not, is that what’s captured: 1) doesn’t necessarily have anything to DO with the actual meeting, 2) is a mishmash of info that popped into our head during the meeting, and/or 3) is an amorphous mix of next actions, mixed with reference info, mixed with doodles! 1. Just as with any capture tool, you want to have as many as you need but no more than you need. Try to have just one or two notebooks that you actively use. It’s much easier to process and organize when you have one notebook, versus having multiple ones. 2. Always date stamp the notes. You don’t want to waste time going back to your calendar to determine when the meeting took place. 3. When processing your notes, go one page at a time, looking for next actions, projects, reference info, ideas, etc. Organize them (manually) into their appropriate places in your trusted system. 4. If you don’t have time to process the notes immediately after the meeting, tear them out of your notebook, toss them into your inbox, and process them within 24-48 hours of the meeting. (Trust me, the abbreviations and scribbles will be much easier to decipher.) If you’re using an electronic note-taking tool, either print the notes out and toss them into your inbox, or write a hand-written note that says “process notes from 8.28 meeting” and put that into your inbox. 5. Ideally, after the notes have been processed, they either get filed if you need/want to keep them, or they get tossed. If you use a spiral notebook and have resistance to tearing the pages out (you know who you are! ), take a pen and draw a line through the pages that have been processed. That way your brain doesn’t feel like it has to re-process the notebook from beginning to end. Doing these behaviors consistently will alleviate having a backlog of notes (and notebooks!) to process later. Julie Ireland is a GTD Coach with GTD Focus, the certified partner for coaching in the U.S.